Alexandra Seremina, a graduate student in Romania, has translated this page into Romanian for readers who are more comfortable with that language. One important but ugly fact is commonly ignored in displaying images on computers: the display is generally nonlinear. For example, a frame buffer value of 100 will almost never give half the brightness of a value of 200. Historically, this is due to the physics of CRT monitors, but newer display technologies emulate the behavior. This is not only for (sorta) compatibility, but for solid reasons based in the science of human visual perception. where L is the radiance (light intensity) from the monitor, ν is the voltage applied to the CRT gun (normally proportional to the digital value in the frame buffer), and γ (Greek letter “gamma”) is a constant particular to the monitor; it's the unknown parameter that makes it all work. It usually ranges from about 2.0 to about 2.5. One useful fact is that the gamma curve is linear in log-log space (i.e. logL as a function of logν), and γ is just the slope of that line. The direct way to measure gamma is with a photometer: a device to measure light intensity on a linear scale. The basic procedure is to set up the monitor as it will be used (brightness, contrast, etc.) and to display an area of a specified digital value. By varying the digital value, we can fit the resulting transfer function in log-log space, and come up with a value for gamma. The first obstacle to this procedure is that you may not own a photometer. Fortunately, gamma can be found visually to some accuracy by displaying a particular type of image. Here's a lovely example from Greg Ward Larson: it's part of the Radiance software distribution. See this page for Greg's explanation of gamma correction. The idea is this: there's a pattern down the left that is half black (0) and half white (255) in alternating stripes. These should average together to give an overall luminance of 50% of maximum. On the right is a series of labeled patches; these are 50% gray with various gamma corrections applied. Just find the patch that seems to match the brightness of the left strip, and read the gamma of your monitor from there. Actually, there are a few potential problems you need to know about. First, your monitor may be adjusted wrong. If the black level is set too low, there will be a bunch of digital values for which the monitor will display black. This constitutes a nonlinearity that is guaranteed to mess up the test above; likewise if the black level is set too high. The black level is generally controlled by the "brightness" knob on your monitor. Here's an image to help you adjust black level. Turn the contrast on your monitor up all the way (or to a comfortable viewing level). Adjust the brightness until you can barely make out the letter in the image. 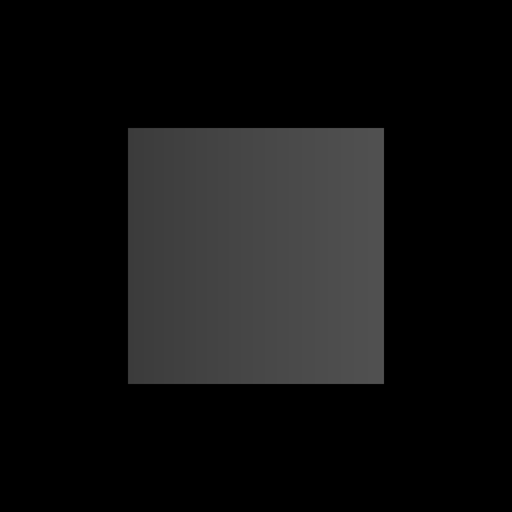 Ideally, the black raster of your monitor will now be just on the edge of visibility compared to the area just outside it. One common mistake that people make in designing a gamma test pattern is using vertical stripes, or a checkerboard pattern at maximum pixel frequency. The following image should show a constant brightness, but half is darker on my CRT display. On a good LCD (Apple 20″ Cinema Display), they look much more similar, but still not identical. The problem is that most display devices have different characteristics in the vertical and horizontal directions: their resolution isn't actually isotropic, and this interacts with the nonlinearity to give a bogus result. Another "gotcha" in gamma correction is its interaction with quantization. 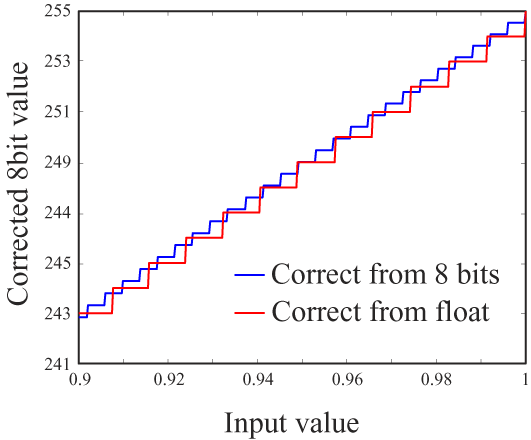 Images are almost always stored as arrays of integers, usually 8-bit integers. Storing an image this way without gamma correction is likely to cause problems, because the eye is more sensitive to luminance variations at the dark end of the luminance scale. Put another way, you need smaller quantization steps at the low end. See the banding in the following image? You can see how quantizing from linear 8-bit values (e.g. from a file) skips levels in the output; there are no output values less than 20! It doesn't matter as much, anyway. Let's look at another part of the same graph, this time for the brightest values. You can see that the quantization step has only about doubled from the case of linearizing from the 8-bit values. But there's a more important factor: Weber's Law. This states, most fundamentally, that discrimination is nonlinear: we are more sensitive to small changes when the stimulus magnitude is small. In this case, it means we can distinguish finer brightness variations in dark areas of an image. So we actually need finer quantization for small pixel values, which is what the red line shows in the graph above. See how much better the image below looks?  I created it by starting with floating-point pixel values, correcting for gamma first, then quantizing to 8 bits. The transfer curve is essentially the red line in the graphs above. 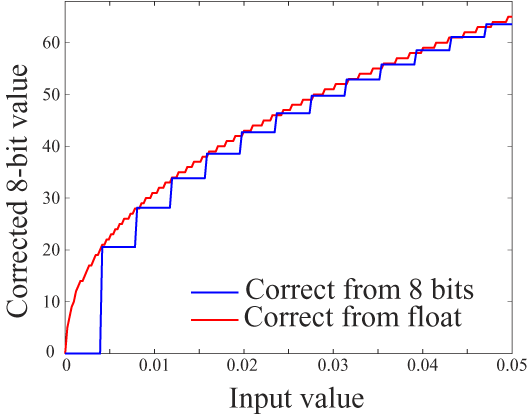 I then converted to 8-bit unsigned integers and wrote a TIFF file of each. I then used Photoshop to add black borders; a bright surround tends to mask quantization artifacts in dark images.